The knife-trunnioned Victor Key by E.S. Greeley was patented December 26, 1882. Different trunnion or support assemblies were employed during this time in an attempt to avoid the off-centering of the lever arm previously caused by the wearing of brass on steel. The Bunnell Triumph key design we are all familiar with eventually succeeded. By the turn of the century, telegraphers were experiencing a malady that came to be known as "glass arm." Inventors experimented by changing the action of keys from vertical to horizontal. The Bunnell sideswiper (above, left) was one way of changing to a side action and speeding up the rate at which code could be sent. It helped prevent telegrapher's glass arm by avoiding repetitive up and down motion. 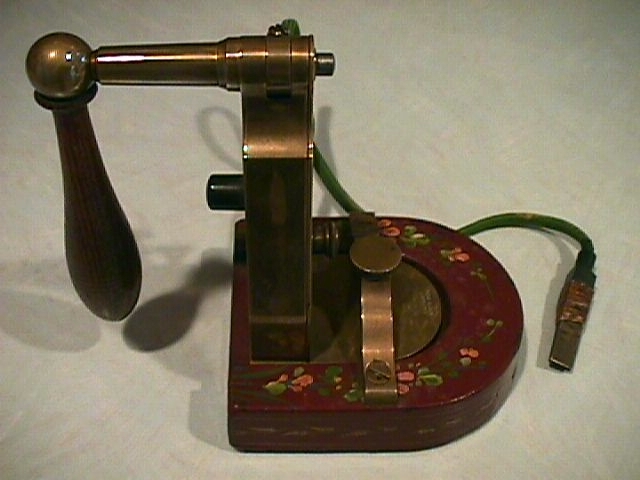 Other inventions, such as the Foote Pierson 20th Century Key (above, right) and the Yetman typewriter were less successful. The invention that took the telegraph world by storm was the semiautomatic key or "bug" by Horace Martin in 1904. This Vibroplex Original, serial number 1571, was made before 1910. The earliest known Vibroplex serial number is 400 and very few under 500 are still in existence. If a glass rod is rubbed vigorously with a silk cloth, it will become positively charged. If a hard rubber rod is rubbed with a piece of wool, it becomes negatively charged. These rods can then be used to charge two small pith balls suspended by a fine silk thread. Pretend your mouse represents the rods and click on the pith balls. Your experiments will show that "like charges repel, and unlike charges attract." From "A Treatise Upon Wireless Telegraphy and Telephony" by C.I. Hoppough, 1912. A Bug By Any Other Name? In the 1920's, Bunnell introduced a semiautomatic key it called the "Gold Bug". Vibroplex filed a lawsuit, claiming that it held a legal Trade Mark awarding it exclusive rights to call its machine a "bug." To outsiders, the suit must have appeared to be a war among the two biggest telegraph key maker giants. The judge decided that the word "BUG" was a term in common use and therefore could not alone be used as a trademark. This was a victory for J.H. Bunnell & Co and Vibroplex's lawsuit was dismissed. Click the question mark to see the text of the judge's decision, which is only about a page long. Next page for more keys!